The lipid components of lipoproteins are insoluble in water. However, because of their detergent-like (amphipathic) properties, apolipoproteins and other amphipathic molecules (such as phospholipids) can surround the lipids, creating the lipoprotein particle that is itself water-soluble, and can thus be carried through water-based circulation (i.e., blood, lymph). Apolipoproteins also serve as enzyme cofactors, receptor ligands, and lipid transfer carriers that regulate the metabolism of lipoproteins and their uptake in tissues. In lipid transport, apolipoproteins function as structural components of lipoprotein particles, cofactors for enzymes and ligands for cell-surface receptors. In particular, apoA1 is the major protein component of high-density lipoproteins; apoA4 is thought to act primarily in intestinal lipid absorption. Further, apoE is a blood plasma protein that mediates the transport and uptake of cholesterol and lipid by way of its high affinity interaction with different cellular receptors, including the low-density lipoprotein (LDL) receptor. Recent findings with apoA-I and apoE suggest that the tertiary structures of these two members of the human exchangeable apolipoprotein gene family are related. The three-dimensional structure of the LDL receptor-binding domain of apoE indicates that the protein forms an unusually elongated four-helix bundle that may be stabilised by a tightly packed hydrophobic core that includes leucine zipper-type interactions and by numerous salt bridges on the mostly charged surface. Basic amino acids important for LDL receptor binding are clustered into a surface patch on one long helix. There are two major types of apolipoproteins. Apolipoproteins B form low-density lipoprotein ("bad cholesterol") particles. These proteins have mostly beta-sheet structure and associate with lipid droplets irreversibly. Most of the other apolipoproteins form high-density lipoprotein ("good cholesterol") particles. 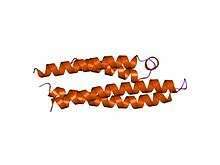 These proteins consist of alpha-helices and associate with lipid droplets reversibly. During binding to the lipid particles these proteins change their three-dimensional structure. There are also intermediate-density lipoproteins formed by Apolipoprotein E.
Exchangeable apolipoproteins (apoA, apoC and apoE) have the same genomic structure and are members of a multi-gene family that probably evolved from a common ancestral gene. ApoA1 and ApoA4 are part of the APOA1/C3/A4/A5 gene cluster on chromosome 11. Hundreds of genetic polymorphisms of the apolipoproteins have been described, and many of them alter their structure and function. Apolipoprotein synthesis in the intestine is regulated principally by the fat content of the diet. Apolipoprotein synthesis in the liver is controlled by a host of factors, including dietary composition, hormones (insulin, glucagon, thyroxin, estrogens, androgens), alcohol intake, and various drugs (statins, niacin, and fibric acids). Apo B is an integral apoprotein whereas the others are peripheral apoproteins. ↑ Saito H, Lund-Katz S, Phillips MC (July 2004). "Contributions of domain structure and lipid interaction to the functionality of exchangeable human apolipoproteins". Prog. Lipid Res. 43 (4): 350–80. doi:10.1016/j.plipres.2004.05.002. PMID 15234552. ↑ Wilson C, Wardell MR, Weisgraber KH, Mahley RW, Agard DA (June 1991). "Three-dimensional structure of the LDL receptor-binding domain of human apolipoprotein E". Science. 252 (5014): 1817–22. Bibcode:1991Sci...252.1817W. doi:10.1126/science.2063194. PMID 2063194. ↑ Fullerton SM, Buchanan AV, Sonpar VA, Taylor SL, Smith JD, Carlson CS, Salomaa V, Stengård JH, Boerwinkle E, Clark AG, Nickerson DA, Weiss KM (June 2004). "The effects of scale: variation in the APOA1/C3/A4/A5 gene cluster". Hum. Genet. 115 (1): 36–56. doi:10.1007/s00439-004-1106-x. PMID 15108119.